Tree surgery is a highly skilled profession given the dangers that are present. That’s why we employ only highly trained, highly qualified, fully insured tree surgeons. 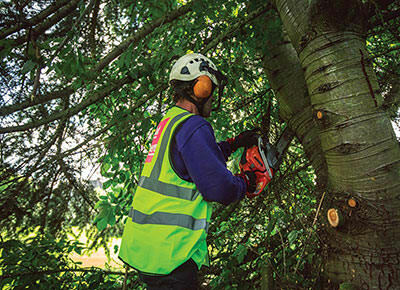 We provide a full range of tree surgery services including Tree Pruning, Tree Felling, and Deadwooding, as well of course as ongoing tree maintenance. What’s more, as much of this work is carried out at very short notice, we offer our clients a 24 hour emergency call out service to ensure that we can keep your environment safe at all times. So, whenever you need us you can be sure that we’ll be there. Out There carry out extensive Tree Surgery for the Northern Ireland Housing Executive across their entire portfolio throughout Northern Ireland.